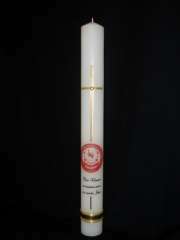 A tall, elegant candle to commemorate 100 years of Baradene College of the Sacred Heart. This candle measures 600mm in height, and the 65mm diameter was adjusted to fit the brass holder perfectly by adding layers of fine wax at the base. + and a gold band which is triple edged on both sides. Presented in a quality gift box for easy transport and storage. For further photos please click here for our Gallery Section. Please contact us today to discuss your own requirements.